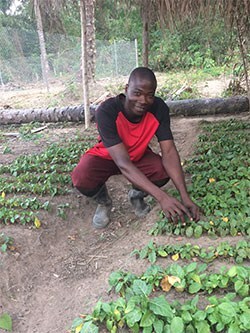 Omar Diouf is Project Manager for the USAID-funded Mali Horticulture Scaling Project. He previously worked in CERAAS, a regional West African Center specializing in drought adaptation research with a multidisciplinary approach for about 14 years. He has a strong background in ecophysiology with research experience in drought adaptation and its interactions with other biotic and abiotic factors. He extended his research work in crop modeling as a decision-making tool. He served as Science Coordinator and Team Leader in the Potou Millennium Villages Project of the UNDP where he launched the first phase of the project in Senegal. Most recently he was Regional Operations Manager of the Millennium Promise/Millennium Development Goals Center for West and Central Africa in Senegal, where he ensured all Millennium Villages projects received the scientific, technological and financial support and guidance needed to achieve the MDGs at the community level. Dr. Diouf was the Scientific Coordinator of the Centre Africain de Recherche sur Bananiers et Plantains (CARBAP), a regional research center of excellence of CORAF/WECARD. He was provided input for defining the global strategy of the research center in terms of scientific organization, deliveries and fundraising.